LanaiScapes - Pots. Plants. Proportions. The numero uno, top of the list, head mother mistake that I see over and over again is the disconnect between pots and plants and their proportion to their surroundings. I get it. 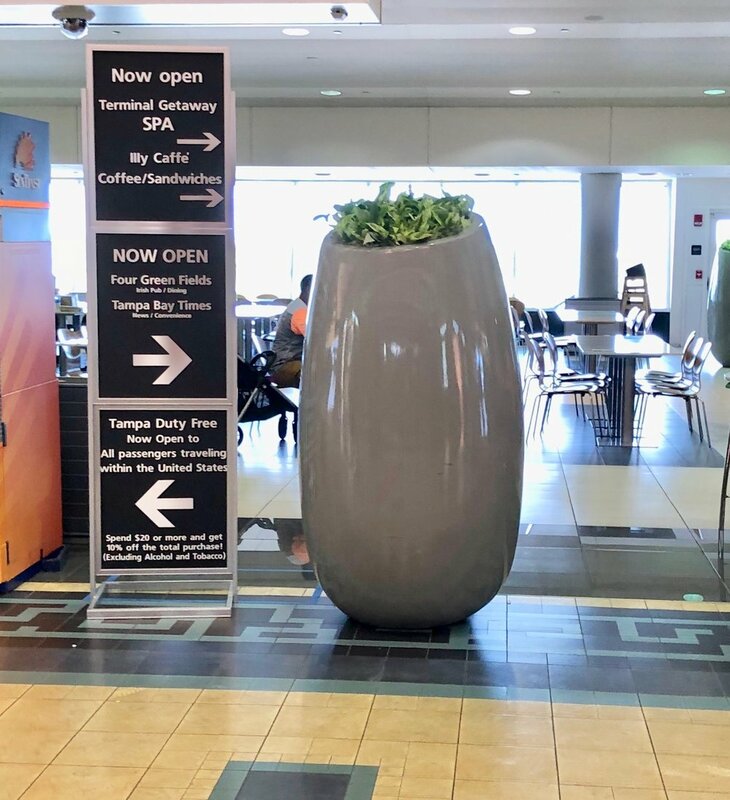 Whichever you buy first, the pot (usually) or the plant, each seems a lot larger in its retail space than in its new home. So after you haul those babies into your outdoor space, all excited to finally have something new and pretty to look at, you stand back and think "What the hibiscus! These look so dinky!" Pour a glass of something and read on. It's not just you. There are plenty of professionals who make proportional planting errors. Think of this like clothing: dress for your shape. Yes, theoretically you can wear anything...hello Florida! But if you want to look your best, you work with body type guidelines. Approach pottery shapes the same way, then accessorize with the plants. First up, the Mork From Ork pot at the Tampa airport. Am I right? This very large pot looks like it has a chia pet toupee. In this case a proportionally vertical plant wouldn't fit in this space. To offset the height, a full, bushy planting with vines trailing down would be great. It’s also begging for some color. Working off the same basic shape, this row of pots, while looking like giant shaving brushes, is wonderfully large and in proportion to this spacious hotel lobby. I absolutely love how the pots frame the view of the red glass chandelier with not only their linear position but with the horizontal shadows cast on the floor. Lovely. And yet, the same fabulous pots went outside for a ride and they never came back. Whoa, this is a million pounds of wrong. They totally dominate the bench like Easter Island monoliths. The landscaping could have been designed to proportionally transition them to the space, but it wasn't. And the plantings in the pots...well, there's a chia planter in Tampa looking for a date. A quick way to check balanced proportions is to look crosseyed at it. (Or, take your glasses off.) When your subject is out of focus you’ll know immediately if one part is dominating the other. You don’t have to look crosseyed at this bottom planter arrangement to know it’s totally out of balance. In future writings I will highlight different shapes and their challenges. In the meantime, be aware of your space and proportions. If in doubt when you’re buying a planter, buy the next size bigger. Trust me on this.